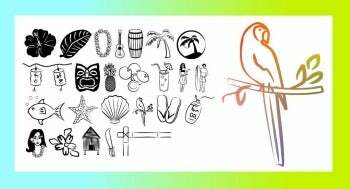 If you need graphical elements, Tropicana--a TrueType dingbats font from Blue Vinyl, maker of Tiki Tooka--may awaken your inner beachcomber. Tropicana comprises 26 different depictions including fish, hibiscus, palm trees, a parrot, seashells, tiki, and umbrella drinks. Tropicana's smooth, elegant lines and island images make it a lovely addition to your party decor. All Tropicana's dingbats are drawn using stylish smooth lines and impeccable attention to detail. Some of the icons are classy enough to use for even a beach wedding or non-flip-flop event. For most of the characters, 18 points is the minimum size for clarity. However unlike most dingbats fonts, Tropicana holds up well to being greatly oversized: This font is a step above your normal pictorial icons. Tropicana is free for personal use; for commercial use contact the designer, Jess Latham. As with Tiki Tooka, Latham is currently in the process of converting Tropicana to OpenType. Note: To use this font, unzip the folder and install the .ttf file in the folder C:\Windows\Fonts. Note that the font won't appear in your applications until you close and re-open them.